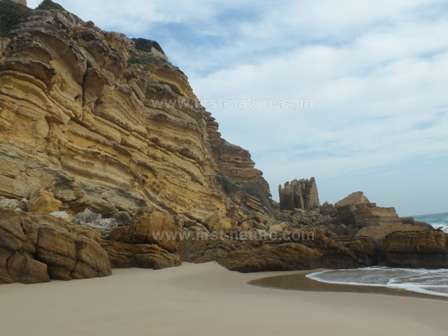 This is a short stroll down to a delightful sandy cove close to Salema in the western Algarve. Spring comes very early in the Algarve region of Portugal, and it has become our tradition to walk this track (1km each way) down to the coast on Christmas Eve, when there are usually plenty of spring flowers already in bloom. Once the real summer heat gives way to the cooler temperatures and rain of autumn, plants that lie dormant throughout the hottest weather are stimulated into growth. Whenever the weather follows its normal Mediterranean pattern of hot dry summers followed by mild wet winters it is very likely that by the end of November of the preceding year you will see evidence of the plants that will bloom in February, March and April: orchid leaves will be clearly visible in the stony grassland areas, tiny lupin plants will be growing and some of the really early plants may even produce flowers. 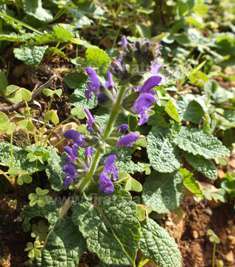 It is one of the natural delights of the Algarve that you can frequently find spring wildflowers and fungi growing together in November and December - a sight that we would hardly ever witness in the colder parts of northern Europe, where at this time of the year winter will be well and truly taking hold. If you are travelling along the A22 toll road in a westerly direction you should take the exit signed to Vila do Bispo and Lagos, which is Junction 1. Keep following signs towards towards Vila do Bispo, which will take you onto the N125. Continue westwards along the N125 until you come to a roundabout that provides access to the vast Parque da Floresta villa development on the right and a small road signed towards Salema and Figueira from the left. 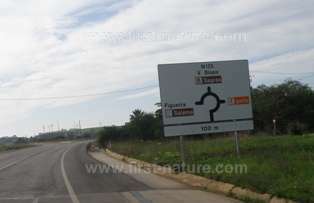 Follow the signs towards Figueira and you will soon enter the village and see the left hand turn shown in the photograph below. Take this turn and drive along an extremely narrow track which opens up into farmland. At the end of the track (about 400 metres) you will see a sign prohibiting vehicles from going any further. Park on the right, where the car park overlooks a pond, and then continue on foot along the track, which soon becones a narrow path, down to the coast. 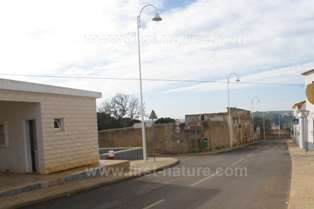 There are no facilites at any points on the walk itself, but there are cafes and shops in the nearby villages. The track is easy-going and not too steep, although narrow and rough underfoot in places. The river, which runs through the valley on the right of the track as you descend, enters the sea and can make getting onto the beach difficult if you visit in winter or early spring. Some precarious stepping stones have been placed in the river just above the beach and this make access to the beach possible, but you risk getting muddy feet. Once summer arrives the river all but disappears and crossing to the beach is easy. This walk takes you down a track which passes through farmed land on the right and, lower down, an area of dense shrub before you reach the floor of the valley and the delightful and very secluded cove of Praia Figueira. On either side of the valley dramatic cliffs are home to numerous birds, including raptors. We have seen Buzzards and Common Kestrels in the valley. The shrubs are alive with small birds, which you can hear but not often see as you stroll along. 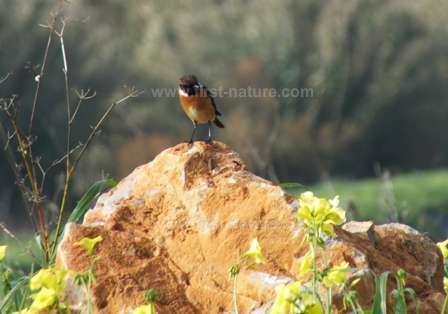 As in so much of the Algarve the 'star' bird at Figueira is the Stonechat, named after its curious call that sounds just like two pebbles being tapped together. These are friendly birds that often perch on tall twigs and on rocks in clear view, but they are not so friendly that they stay still long enough to allow you to get a decent photograph - the one on the left is a fluke! Common Chiffchaffs contribute to the birdsong in the valley. Other birds to look out for include Spotless Starlings, Blackcaps, Dartford Warblers and Meadow Pipits. Robins are also common in winter. This valley is a great place for seeing early spring wildflowers, and from late December onwards many species gearing up for spring produce their first blooms. Apart from the pesky Bermuda Buttercup, Oxalis pes-caprae, which is everywhere at this time of the year, you are likely to see Sweet Alison, Lobularia maritima, the deep purple (occasionally white) Wild Clary, Salvia verbenaca, Paper-white Narcissus, Narcissus papyraceus, Rosemary, Rosemarinus officinalis, Grey-leaved Cistus, Cistus albidus. If you look very carefully you will spot the lovely little Friar's Cowl, Arisarum vulgare, peering up from beneath its arrow-shaped leaves. Later in spring many other flowers bloom including several types of cistus which thrive on the rocky slopes, and there are even a few wild orchids growing in the lower part of the valley, with some particularly fine groups of Bumblebee Orchid, Ophrys bombyliflora, hugging the bushes. Praia Figueira is also a good beach for the Sea Daffodil, Pancratium maritimum, which along with the tough Spanish Oyster Plant, Scolymus hispanicus blooms late in the season and often persists through July and August when all the other flowers have given in to the searing heat and drought of summer. Wherever plantlife is good insect life is also good, and in late spring and well into summer the valley is humming with insects. Butterflies are particularly plentiful in the Algarve and many continue flying through the winter: we have seen fields full of Monarch butterfiles in November, for instance. Although less numerous in winter you can still expect to see a few Large White, Small White, Small Copper, Clouded Yellow, Painted Lady, Red Admiral, Wall Brown and Speckled Wood butterflies. Spring in Portugal comes just as the depths of winter get a grip in northern Europe, and so a walk in bright Algarve sunshine with spring flowersblooming in December makes a visit to this lovely little valley doubly delightful.